The latest estimate shows that 1 in 68 children (1 in 42 boys and 1 in 189 girls) as having autism spectrum disorder. This means that more than ever, special education teachers in order to be effective, will require additional resources and support. the following links showcase a number of blogs and information on working with children with autism. Savvy teachers are creating and developing blogs on teaching children with autism. Many of the blogs give first -person accounts while others share classroom activities, lesson plans and classroom management. The following links discuss strategies on engaging learners and managing students in a classroom setting. The following links are tips and strategies that are specific to teaching techniques and helpful information on setting up the classroom, data collection and scheduling. The following sites are great resources specifically for teachers working with children with autism. Many of the sites include free downloads and other resources including curriculums, lesson plans and data collection. A resource for teachers, therapist and parents including a free IEP goal bank, parent resources and an assortment of tools and resources on a variety of topics. Autism Educators, Inc. is currently offering a Teacher’s Wish List promotion. This site includes information for individuals with autism and other developmental disorders. Links include information on topics such as toys and games, curriculum management and child safety just to name a few. This site contains free resources on lesson plans on a variety of topics including data collection, seasonal, inclusion for teachers and life skills. A great site for parents, therapist and teachers. Downloadable printables on topics relating to body parts, colors, data recording, handwriting and emotions. Provides therapeutic tools and resources for individuals on the autism spectrum. A resource website for parents, therapist and teachers. Resources include information on fine motor, structured task, social skills, and at home. Provides more than 100 pages of free printable items. An autism blog created by Sasha Long, a board certified behavior analysis and certified special education teacher. Do you know of any links and resources not listed? if so, please send an email to: specialneedsresourceblog@gmail.com and we will add them to the list. This entry was posted in Autism, Autism Spectrum Disorder, Special Educators, Teachers and tagged classroom, classroom tips, life skills, special education, Special Educators. Bookmark the permalink. 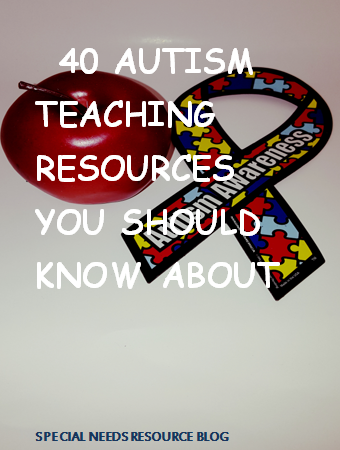 An expert blogger has compiles 40 resources to help students with autism. The list is from 2016, but it’s still valid.